The presidential campaign of 2016 brought about an increase in the spread of disinformation through media outlets and online networking platforms. The term “fake news” can be defined as news stories that are false with fabricated quotes, sources, and/or facts. Some stories may include small bits of the truth but are written with language used to sensationalize a topic. In “Where ‘fake news’ flourishes: a comparison across four Western democracies” by Edda Humprecht, she defines “online disinformation” as “rumors, ‘counterknowledge’, ‘post truths’, or ‘alternative facts’ typically published on websites and disseminated via social media for profit or social interests” (Allcott & Gentzkow, 2017). Fake news is usually circulated through social media which is where the false claims are perpetuated and often taken even further. Fake news initially became popular during the 2016 US presidential election but the use of fake information during the political process is nothing new. In “Fake News and the Third-Person Effect: They are more influenced than me and you”, “modern communication, however, can allow anyone to create and distribute fake content, as well as to transform false information into a business” (Stefanita 11). Why did Fake News spread? The authors of the misinformation are motivated to spread the fabricated news stories for multiple reasons. Some of these articles are written by people who receive money for publishing content regardless of the integrity of the story. Authors of disinformation may be trying to make a point or entertain the reader with sensationalist rhetoric and off-the-wall stories. Fake news can be a result of a poor or untrained journalists who are trying to keep up with the drastic increase in news cycle websites. Another reason people write and publish fake news is to push their own personal political view with the hope that they will influence others’ and policy makers. The ease of online copy and paste functions has added to the proliferation of these false articles. Some of these articles are posted on certain sites to evoke an emotional response therefore enticing people to share with others. “Bots” are computer algorithms designed to act like people sharing information and are also responsible for generating fake news and spreading the misinformation. In “Truth is what happens to News” by Silvio Waisbord, he states “the communication chaos makes it necessary to revisit normative arguments about journalism and democracy as well as their feasibility in radically new conditions.” He explores how one may navigate through today’s definition of news and ways to come to the conclusion if it is true or not. Based on the article titled “Developing a Critical Nose for News” by Ben Bayer, “countless people believe fabricated messages they get from computer strangers everyday on the Internet” (Bayer, 1). It is important to read the full story before clicking the share button and ask yourself if the story sounds plausible. Next, it is important to analyze if the story is reported like a normal news story or is the title and language sensationalized? The most important advice to give in spotting fake news is “What is the source of this story and what do I know about it?”. Is the source credible? Can you look the story up on google and find similar news postings about the topic? The next important question when analyzing if a story is true is “How likely is the story to be true in the first place?”. Think about what you know to be true and see if the story matches up with that. Consider if the type of story would ever occur in real life and does it make sense in the real world? If a story seems outlandish, it is more often than not a fake story written by an author intending to catch your attention for a share. Consider if the story were true, what else would have to be true? If the story seems like it could be plausible it is important to investigate other news sites for their version of the facts. If the story seems like it is a huge event and other news outlets are not reporting about it… chances are it is not true. 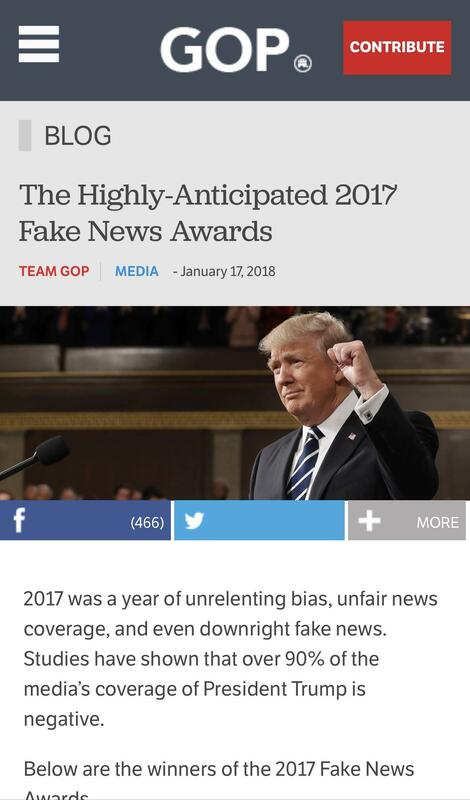 The GOP website features a satirical take on fake news: “the 2017 Fake News Awards”. Check it out: https://gop.com/the-highly-anticipated-2017-fake-news-awards/. The list covers the news stories deemed as fake by the website. This is a great example of fake news analysis and shows the impact of the misinformation in the presidential campaign of 2016. A Solution for Fake News? The best way we can combat this epidemic of fake news starts with our own personal actions. As time goes on, news outlets will continue to grow and sadly that means more fake news will circulate. It is important for us, as readers, to consider the source before believing the story. There are too many fake stories for us to believe what we read at face value. The idea I have to conquer this issue of fake news is the development of a website where we copy and paste fake news articles in to the website so people can search through and find the story they are reading if it is fake. The website will have tips on identifying fake news stories as well as a compilation of articles that have been debunked. The website will be reviewed every day and sifted through to make sure all the stories are actually fake. In addition to the compilation of fake news stories, there will be a section of the website with lists of “authors” that have been caught generating these fake stories so people know who to look for when an article seems fabricated. Politifact.com is another example of a website that aims to fact-check especially when it comes to politics. Explore the website here:https://www.politifact.com/personalities/blog-posting/statements/by/.